'Big Brutus,' World's Largest Electric Shovel, Turned Into Museum Big Brutus is the world's largest electric shovel, standing 16 stories in the fields of southeast Kansas. The coal mine it helped dig has long been shut down, and Brutus has been turned into a museum. When I told folks in Kansas that I was going to be in the southeastern corner of the state, everybody said, you've got to go see Big Brutus. What's Big Brutus? It is the world's largest electric shovel. So we headed to West Mineral, Kan.
Big Brutus is the world's largest electric shovel. It stands 16 stories high amid the fields of rural southeast Kansas. The coal strip mine it helped clear of rock and dirt has long been shut down, and Brutus has been turned into a museum. You can see it on the horizon from miles away. At the very top, it's 160 feet, or like a 16-story building. Our guide is Betty Becker, 75. She's the manager of Big Brutus and the mining museum — and she's been working here since the place opened in 1985. Big Brutus weighs 11 million pounds — that's 5,500 tons. 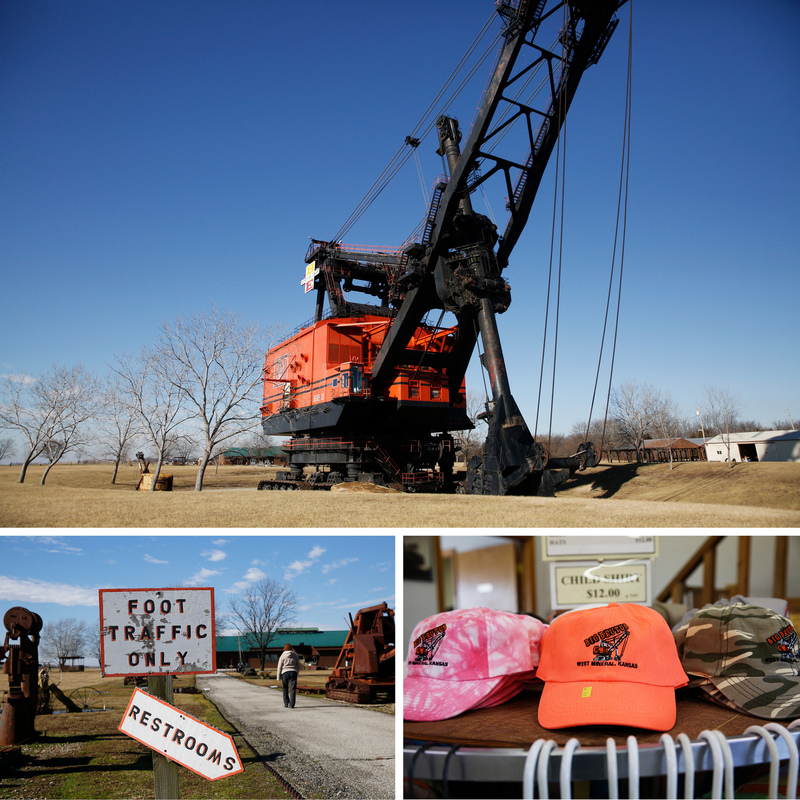 He's painted bright orange and once had the job of scooping rock and dirt off the coal seam in a strip mine. Each bucket load could fill three railroad cars. "It took 52 men about 11 months to assemble," explains Betty. The cost, back in 1962: $6.5 million. Big Brutus worked 24 hours a day for 11 years. When the Pittsburg & Midway coal mine shut down in 1974, Big Brutus dug his last pit in West Mineral. They backed Brutus out and parked the giant in the fields. It would have cost too much to dismantle, so they just left it right where it stood. Betty Becker, 75, oversees Big Brutus and its visitors center in West Mineral, Kan.
We climb up a metal staircase until we're five stories off the ground. The boom goes up another 100 feet or so. You used to be able to climb all the way up there, too. Some people even got married up there, but not anymore. We turn the corner and find the glass-enclosed compartment, where the shovel operator would sit — with a nice view of Kansas farmland from up high. It took huge amounts of power to run this electric shovel. "They plugged it in just like you plug in an electric lamp or something." explains Betty. Betty Becker's father drove a coal truck at the mine, hauling coal from the pit to the cleaning plant. "He passed away on the job," she says. "So he was at work, and we got a call to come to the hospital, and he was gone." She pauses. "So anyway, but that was ... in 1966. That was a long time ago." 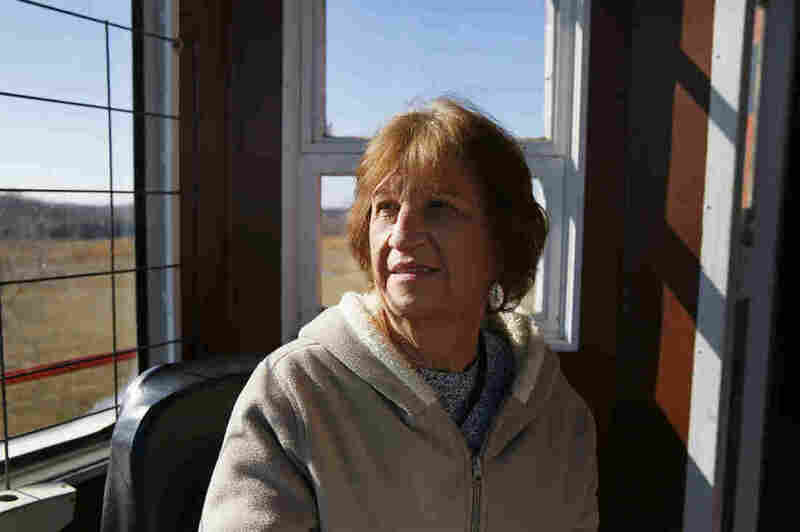 Betty tells me when the mine shut down in the '70s, it was devastating for this community. 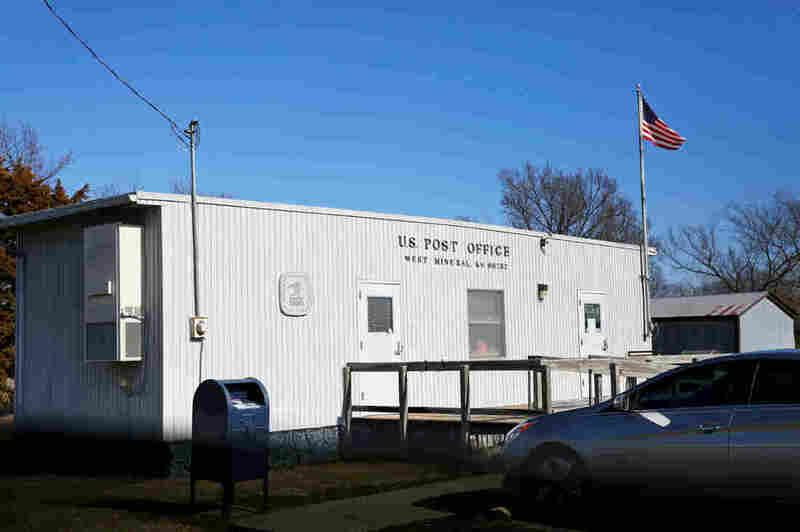 The Post Office is one of the few buildings left in West Mineral, Kan.
"West Mineral got quite a bit smaller because people had to go other places for, you know, work," she says. "And then we lost our school, and just how little towns are gone - they're not as popular anymore. But Big Brutus will be here forever." And after all this time, she's grown awfully fond of the monster machine. "Yeah, it's like part of my family," she says, laughing. "A big part!"